March | 2017 | What Next? I led the last meeting of our children’s writers’ group The Anita Factor . I decided we’d spend some time writing answers to a series of questions that would help us reflect on our own reading and writing experiences. As we shared our responses we learned more about each other. Here’s how I answered three of the questions. 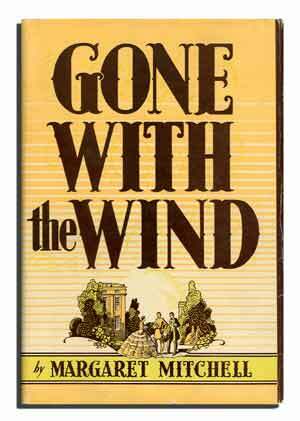 I cried buckets when I read Gone With the Wind. I was about thirteen at the time and happened to be at a particularly sad part of the book during a private concert my mother was hosting. One of her good friends, a composer and musician was debuting a new piano work and Mom had invited a livingroom full of women to serve as her audience for the premiere. Mom had prepared all these lovely tea sandwiches and dainties to serve after the performance and I was to help her serve them. I was up in my room reading Gone With the Wind and crying during the concert so when Mom came to get me to help her serve the food my face was red and splotchy and my eyes swollen from crying. I had become just a puddle reading about all that Civil War devastation. Mom took one look at me and told me to just keep on reading. She would serve the guests herself. What would literary success look like to you? After I retired from teaching I set myself a goal of having a fiction piece published because up to that point I had only had things like newspaper columns, magazine articles, curriculums, meditations, travel pieces and essays published. I achieved my first goal when a short story I had written was published in Rhubarb magazine. Now I have set myself a goal of having two children’s books published. I’d like to publish a picture book and a middle grade novel. If I achieve that goal I will feel like I’ve been successful. I have ideas for other writing projects I’d like to try but for now the children’s books are my goal. What is the first piece of writing you ever had published? 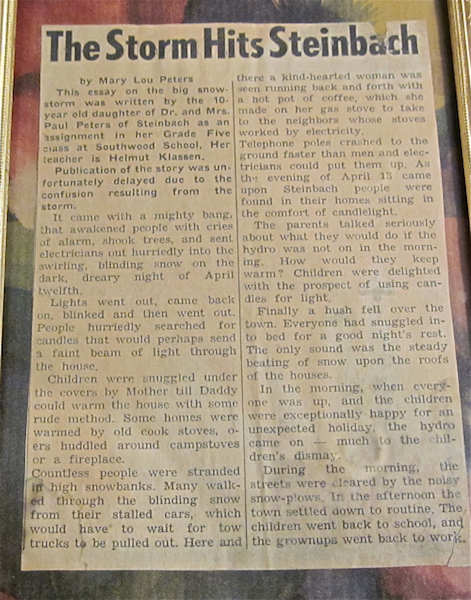 The first piece of writing I ever had published was a story I wrote in grade five after we’d had a major blizzard in Manitoba. I wrote about how the storm had effected our town. My fifth grade teacher Mr. Klassen thought my piece was so good he submitted it to the local paper and they printed it. My Mom cut out the article, created a background out of wrapping paper and framed it for me. I still have it in that same frame. Aleppo has figured prominently in the news of late. We are used to seeing pictures of the devastation the war in Syria has caused there. But did you know that Aleppo is also where writer Agatha Christie wrote her famous mystery Murder on the Orient Express? Agatha Christie and her husband Max Mallowan at one of their archeological digs. Agatha and her second husband archeologist Max Mallowan spent a great deal of time in the Middle East. Agatha helped with photographing, data keeping and restoration at her husband’s sites and continued writing her novels while she and Max worked and traveled. She was spending time in an Aleppo hotel while she worked on the manuscript for Murder on the Orient Express. I just finished the book The Woman on the Orient Express by Lyndsay Jane Ashford. It is a fictionalized account of Agatha Christie’s first trip on the famous railroad in 1928. In the novel she visits an archeological dig where her future husband is at work. The book should probably have been called Women (plural) on the Orient Express because it is told from the point of view of three British women, Agatha the mystery writer, Kathleen an archeologist, and Nancy a young woman running away from personal problems. Kathleen and Agatha try to help her. As we hear Agatha, Nancy and Kathleen’s stories we learn a great deal about what life was like for women in the 1920s. Divorce was scandalous and almost always blamed on the woman. Unmarried pregnant women faced dire social criticism and discrimination and there was absolutely no broad understanding of the science of genetics or gender identity. I learned so much about social history, Agatha Christie and the way the Middle East has changed from reading this book. I have downloaded Murder on the Orient Express by Agatha Christie on my e-reader. I have never read it but Ashford’s novel has got me interested. William Kurelek’s painting Zaporozhian Cossacks has been added to one of the collections on display at the Winnipeg Art Gallery. The title Zaporozhian Cossacks immediately connected with me personally. We stayed in the city of Zaporozhia in Ukraine during the week we were exploring the places where our grandparents had lived before coming to Canada as refugees. Posing on a cossack horse in front of the historic oak tree near Zaporizhia Ukraine. We also took photos at a giant oak tree that was a gathering place for cossacks in the Zaporozhia area hundreds of years ago. In his painting William Kurelek tells the story of a Zaporozhian cossack named Taras Bulba. While a student in Kiev Taras’s son Andriy falls in love with the daughter of a Polish noble. Andriy returns home and his father orders him to take part in a military campaign against the Poles. During the battle Andriy discovers the girl he loves is among the Poles starving to death inside a city the cossacks have surrounded. Andriy smuggles food in to her. His father kills him for his treasonous act. I think the man in the colorful clothes at the centre of the painting is Taras. I am speculating Tarus is talking to a man named Yankel who was the informer that told Taras of his son’s betrayal. But he could also be talking to his own son Andriy who is begging for mercy. 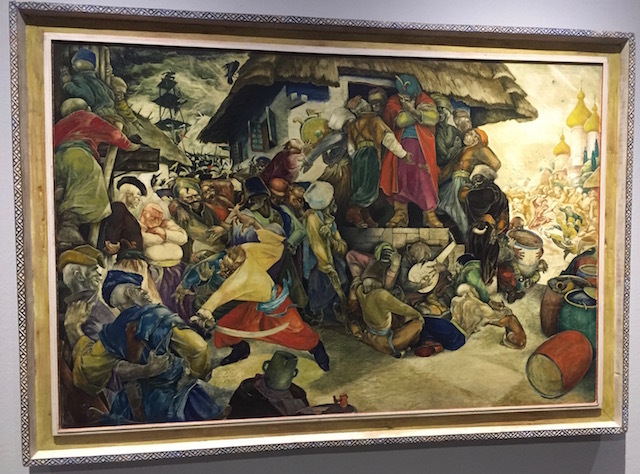 I think these are the cossacks dancing and singing on one side of the painting while on the other side in the background we see the starving Poles inside the besieged city. Could that be Andriy’s executioner in the left foreground wielding a sword? I was particularly drawn to the group of men to the right of the executioner. They seem unperturbed by the chaos around them as they play music and pet a dog. I wish I could talk to William Kurelek about the painting and ask him what he has depicted in its various sections. But as I always tell the children I guide at the gallery each viewer finds their own story in a piece of art. That’s what makes visiting an art gallery so interesting. Like me artist William Kurelek was from a Canadian Ukrainian immigrant family. Kurelek lived on a farm near Stonewall Manitoba as a child and when he was a teenager his family moved to Winnipeg where William studied art at the University of Manitoba. Later he took classes at a fine arts school in Mexico where he was influenced by muralists like Diego Rivera. He painted Zaporzhian Cossacks as a tribute to his father in 1952 just before William moved to England. William is probably best known to Canadians for his illustrations of the books A Prairie Boy’s Winter and A Prairie Boy’s Summer. We went to see the Second City comedy troupe perform with the Winnipeg Symphony last weekend. One of the pieces they presented was called Life’s A Symphony. I liked the idea of comparing life to a symphony but after the concert I couldn’t remember the specific lyrics of the Second City rendition. So I decided to write my own thoughts about why life could be compared to a symphony. 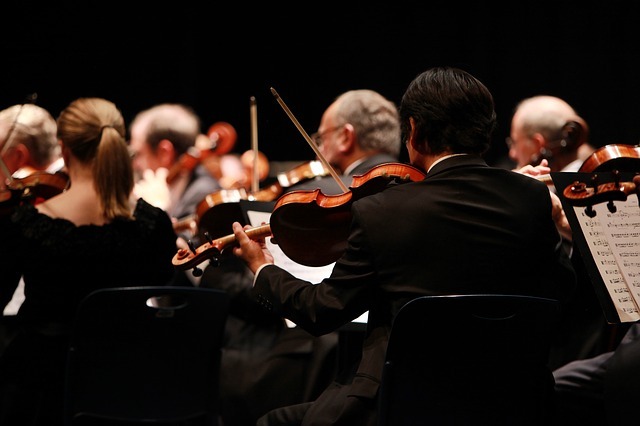 A symphony is divided into four movements or sections. Our lives are divided into sections or stages as we journey through childhood, the teens, adulthood and old age. The music of a symphony can be loud and bright and/or soft and melancholy. There are times in life that are exciting and happy and other times that are solitary and sad. The music of a symphony can move at different speeds adagio (slowly) andante (at a walking pace) allegro (fast) presto (very, very fast). Parts of our life can just whiz by but in some seasons of life we think things are moving very slowly. To perform a symphony many different musicians playing many different instruments need to work together. To get through life we all need the help of many different people. There are sections during a symphony when some of the instruments take a rest. Sometimes we have to do that too in life. We need to take a rest and let others carry on while we rejuvenate and get ready to participate again. Symphonies have a beginning and an ending and so do our lives. Could I Join the Conservative Party? I have never voted for a Conservative party candidate in my life. My world view, social sensibilities and faith stance are more in line with the policies of other political parties. However a political candidate campaigning at my door this week made think about joining the Conservative Party even if only for a short time. I live in Point Douglas, a provincial riding that will hold a by-election in the near future due to the resignation of our MLA Kevin Chief. Jodi Moskal is running for the Conservative nomination for Point Douglas and I have to say she has an impressive resume. A licensed electrician, who helped to run a family business, she has served as chair of the Winnipeg Chamber of Commerce and a board member of the Winnipeg Construction Association. When Jodi came to my door to campaign this week I had a good discussion with her about my concerns and questions regarding some of the current Conservative government’s policies and plans. I also talked to her about issues in our riding that are important to me. Jodi was a good listener, knowledgeable and open- minded. I told Jodi I applauded her for running for the nomination. Deciding to open yourself to the kind of public scrutiny and criticism politicians face can’t be easy. I really wanted to support Jodi because we definitely need more qualified women in politics and I think its great she is taking on the challenge. I could almost see myself joining the Conservatives briefly just to help Jodi get nominated. Unfortunately her party is not one I can support ideologically. I have however started following her on social media. I’ll be curious to see how she does. Kudos to her for entering the political arena!